Welcome to the community! 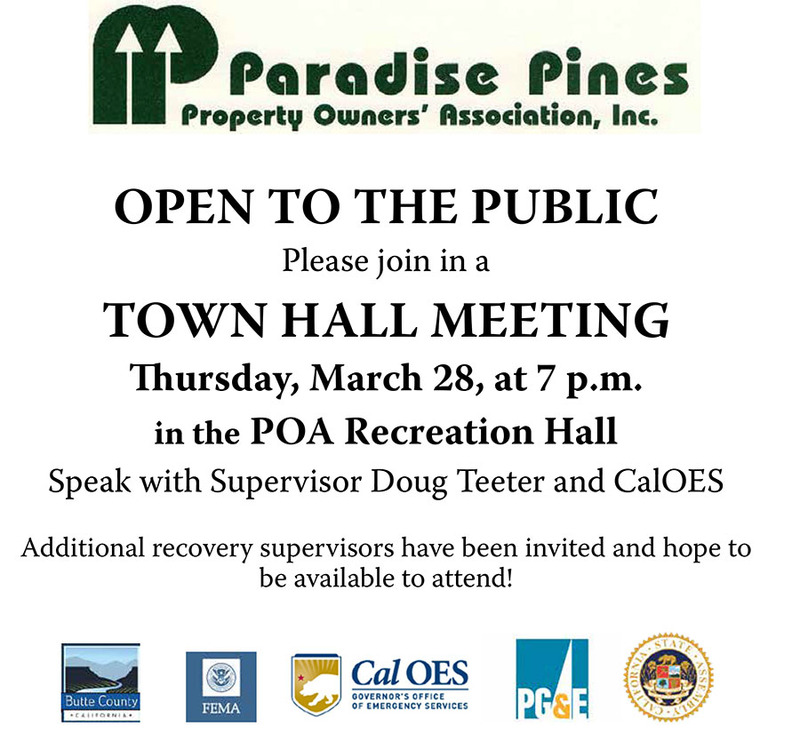 The Paradise Pines Property Owners' Association is a Common Interest Development, with 3,370 properties included, within the area of Magalia, CA. This area has a wealth of recreational areas, local events, and breathtaking natural beauty. If you have any questions about our Association please call our office at (530)873-1114. We look forward to hearing from you! If you are already a member of the association please log in to your User Profile for more information regarding your association. Thank you! ESTABLISH A QUORUM & CALL TO ORDER AT: ____________P.M. 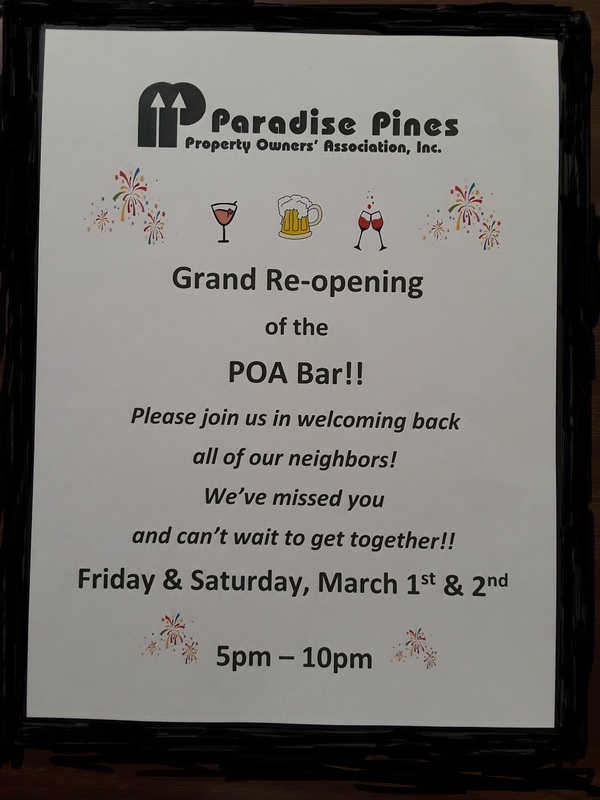 NEXT MEETING IS SCHEDULED FOR TUESDAY, APRIL 9, 2019 AT 7:00PM IN THE POA RECREATION ROOM. the Sierra Nevada Conservancy, an Agency of the State of California and CAL FIRE. are now available on the secured side of our website. 3. Monday, February 11th, at 4:30 pm. are for Home and Property Owners only. the Camp Fire will still require a Tree Permit. Annual Assessment of $235 were due by July 1st! 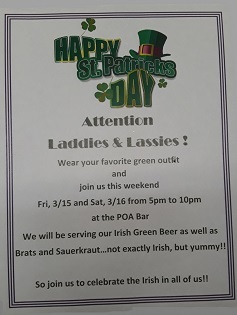 Look for more information in The Nugget! We have the most current issues here on the website! Check them out! submitted online for your convenience. Q: My home was destroyed, do I have to rebuild? A: No, there is nothing that requires you to rebuild your lot. If you do not rebuild, you are still responsible to maintain your lot free of debris and other hazards on a regular basis. Q: My home was destroyed, is the POA going to clean my lot? Q: My home was destroyed, do I still have to pay dues? A: Yes. The dues are not per home, it is per lot regardless if there is a structure on the lot or not. Q: My home was destroyed, am I going to get a proration of my dues refunded? Q: When are the POA facilities going to be opened? A: The Board and management are currently working with the insurance adjusters to approve the cleaning of the buildings that are required in order for us to allow people to enter the buildings. The Administration Office and the Racine Center are now open and the Rec Hall is available for meeting and Activities. The Bar is not yet available. Q: I have trees that were scorched badly, do I need a permit to remove them? A: No. At this time trees that have been damaged, burned or the root system burned may be removed by the homeowner without a tree permit. Q: My insurance company is making me remove all of the trees on my lot. Do I still need a permit? A: Yes, but the permit would be only for the trees not damaged in the fire. (see answer above), and be prepared to show the letter from your insurance company. Q: Is the POA going to dissolve or is the Board of Directors going to dissolve the POA? A: No. The Board of Directors does not have the authority to dissolve the POA. In order for the POA to be dissolved, there must be a vote of the membership with 100% of the owners voting YES to dissolve.